A bridge rectifier "pack" is highly recommended over constructing a bridge rectifier circuit from individual diodes, because such "packs" are made to bolt onto a metal heat sink. A metal box is recommended over a plastic box for its ability to function as a heat sink for the rectifier. A larger capacitor value is fine to use in this experiment, so long as its working voltage is high enough. To be safe, choose a capacitor with a working voltage rating at least twice the RMS AC voltage output of the low-voltage AC power supply. High-wattage 12-volt lamps may be purchased from recreational vehicle (RV) and boating supply stores. Common sizes are 25 watt and 50 watt. This lamp will be used as a "heavy" load for the power supply. 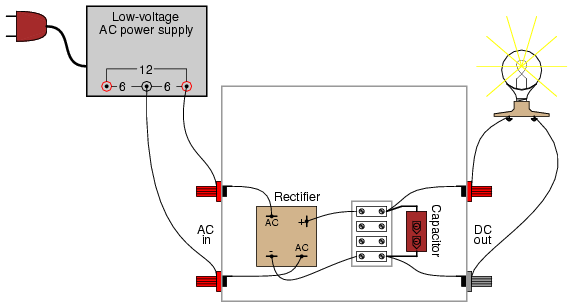 This experiment involves constructing a rectifier and filter circuit for attachment to the low-voltage AC power supply constructed earlier. With this device, you will have a source of low-voltage, DC power suitable as a replacement for a battery in battery-powered experiments. If you would like to make this device its own, self-contained 120VAC/DC power supply, you may add all the componentry of the low-voltage AC supply to the "AC in" side of this circuit: a transformer, power cord, and plug. Even if you don't choose to do this, I recommend using a metal box larger than necessary to provide room for additional voltage regulation circuitry you might choose to add to this project later. The bridge rectifier unit should be rated for a current at least as high as the transformer's secondary winding is rated for, and for a voltage at least twice as high as the RMS voltage of the transformer's output (this allows for peak voltage, plus an additional safety margin). The Radio Shack rectifier specified in the parts list is rated for 25 amps and 50 volts, more than enough for the output of the low-voltage AC power supply specified in the AC experiments chapter. Rectifier units of this size are often equipped with "quick-disconnect" terminals. Complementary "quick-disconnect" lugs are sold that crimp onto the bare ends of wire. This is the preferred method of terminal connection. You may solder wires directly to the lugs of the rectifier, but I recommend against direct soldering to any semiconductor component for two reasons: possible heat damage during soldering, and difficulty of replacing the component in the event of failure. Semiconductor devices are more prone to failure than most of the components covered in these experiments thus far, and so if you have any intent of making a circuit permanent, you should build it to be maintained. "Maintainable construction" involves, among other things, making all delicate components replaceable. It also means making "test points" accessible to meter probes throughout the circuit, so that troubleshooting may be executed with a minimum of inconvenience. Terminal strips inherently provide test points for taking voltage measurements, and they also allow for easy disconnection of wires without sacrificing connection durability. Bolt the rectifier unit to the inside of the metal box. The box's surface area will act as a radiator, keeping the rectifier unit cool as it passes high currents. Any metal radiator surface designed to lower the operating temperature of an electronic component is called a heat sink. Semiconductor devices in general are prone to damage from overheating, so providing a path for heat transfer from the device(s) to the ambient air is very important when the circuit in question may handle large amounts of power. 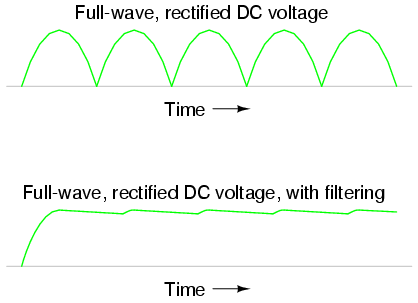 A capacitor is included in the circuit to act as a filter to reduce ripple voltage. Make sure that you connect the capacitor properly across the DC output terminals of the rectifier, so that the polarities match. 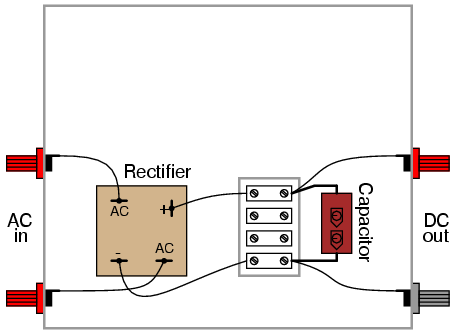 Being an electrolytic capacitor, it is sensitive to damage by polarity reversal. In this circuit especially, where the internal resistance of the transformer and rectifier are low and the short-circuit current consequently is high, the potential for damage is great. Warning: a failed capacitor in this circuit will likely explode with alarming force! 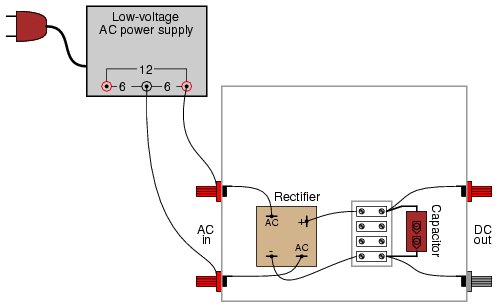 Measure the AC voltage output by the low-voltage power supply. Your meter should indicate approximately 6 volts if the circuit is connected as shown. This voltage measurement is the RMS voltage of the AC power supply. Measure the AC ripple voltage magnitude with a digital voltmeter set to AC volts (or AC millivolts). You should notice a much smaller ripple voltage in this circuit than what was measured in any of the unfiltered rectifier circuits previously built. Feel free to use your audio detector to "listen" to the AC ripple voltage output by the rectifier/filter unit. As usual, connect a small "coupling" capacitor in series with the detector so that it does not respond to the DC voltage, but only the AC ripple. Very little sound should be heard. You may decrease the value of Rload in the simulation from 10 kΩ to some lower value to explore the effects of loading on ripple voltage. As it is with a 10 kΩ load resistor, the ripple is undetectable on the waveform plotted by SPICE.